I am a psychic medium. Ever since I was a girl I have had spirit visitors. Sometimes they were spirits I knew and other times, they weren’t. It wasn’t long before I had the spirits of celebrities showing up to say hi and give me messages. As I grew into adulthood, I learned to welcome their visits and the wisdom that came from the messages they shared with me. I decided to write a book to share these powerful messages with others. This channeled message from Janis Joplin will be in a forthcoming book of celebrity channeled messages from the other side. 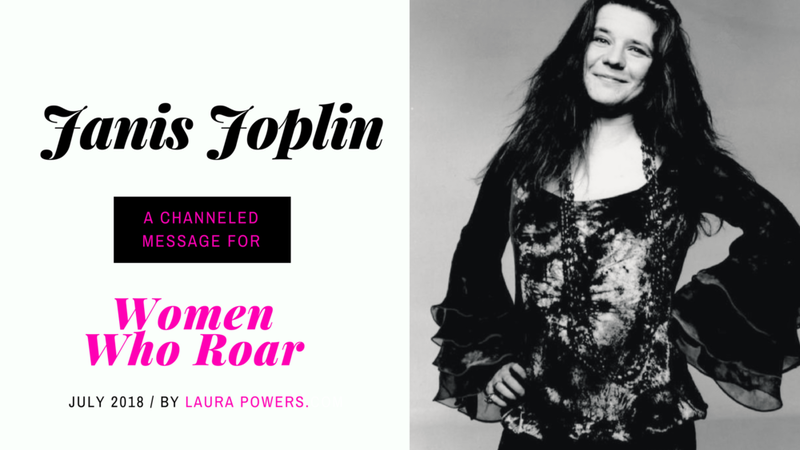 I hope you enjoy this message from Janis Joplin, if there ever was a woman who roared, I think it was her. Message from Laura: Janis Joplin was another incredible, powerful woman whose life was cut short. I often wonder what she would have done if she had lived longer. Even with such a brief, bright life, she is unforgettable. I was on a tour in Los Angeles once and was taken to the site where she died. I could feel her sadness there still even though she died decades ago. Thankfully she is not continuing to experience that pain and sadness now but she does want to help others avoid what she went through. Channeled message: Hello everyone. These are tough times right now. So many of you are in pain and struggling. These tough times will pass. It is time to treat each other lovingly. When people are hurt, that is when they may lash out which just spreads the pain. Be kind to one another. Even the perpetrators of great evil simply often do not know what they are doing. Do not stand for injustice but also do not create more hatred. Hatred breeds hatred. Stand in peace and support each other. Spread love. Stand up for what you believe and those who are suffering at the hands of others but do not turn to hatred. Also, many of you who are empathic and psychically sensitive drown out your sorrows or try to shut out your feelings through drugs and alcohol. This literally just gives you one more problem. If you are sensitive, work and releasing the energy and pain you have absorbed from others. You can do this through meditation, through taking a walk or going out in nature. You might feel the emotions as they come back up for releasing and this is ok. They are purging out of your system and purging usually doesn’t feel good. Know that whatever you are feeling will pass. Ask for my help, ask for help from the angels and channel your emotion into creativity which is healing and helpful for both you and others. Above all, don’t give up hope. You are not alone. Laura is a Celebrity Psychic who has been featured by Buzzfeed, NBC, ABC, CBS, FOX, the CW, Motherboard by Vice Magazine, The Jet Set television show, and many others. She is currently in production for a television show about her work and has two other development deals in place. She is also the author of six books on the psychic realm and hosts and produces a popular podcast, Healing Powers Podcast, on health and spirituality. Laura Powers is a clairvoyant, psychic medium, writer, actress, producer, writer, and speaker who helps other receive guidance and communicate with loved ones.